If there’s a pancake that qualifies as an early morning superhero pancake, a pancake that does it all, this is the pancake. Actually, these are the pancakes, but let’s just stick with the idea of a singular pancake for conversation sake. This pancake is wholesome, healthy, naturally-sweetened, easy to make, and nourishing. You name it, this pancake’s got it from a nutritional standpoint. This pancake will win over even the biggest white-flour-lovin pancake purest. Almond flour and oats are the perfect combo to win over anyone that’s not quite into the dense texture that sometimes comes from whole grains, like whole wheat. This pancake also takes less than five minutes to make. Well, to measure and blend that is. Five minutes to measure and blend the ingredients into a pancake batter, which happens to be done in the blender. Yes, cooking the pancakes will add an additional ten minutes to the process, but fifteen minutes for a hot early morning breakfast? Yes, please! A time frame like that totally qualifies a pancake for superhero status. This pancake can’t get you or your kids out of bed in the morning. This pancake can’t get your kids dressed in the morning. This pancake can’t help you get to school (or work) on time. We all knew that, right?! I add this little disclaimer because I also have some really good news. 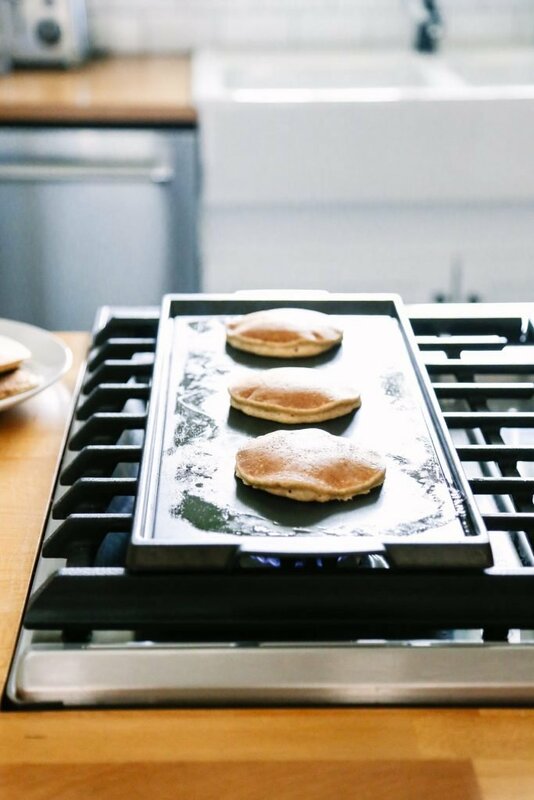 This pancake will actually help you have more time in the morning, which means there’s no excuse for not getting up, getting the kids dressed, and getting to school or work on a busy weekday morning. As I said, this pancake truly does it all, including, making a busy morning easier to tackle. Would you like me to introduce you to this busy morning superhero pancake? Friend, meet the pancake, or more like pancakes, that save our busy mornings over and over again. 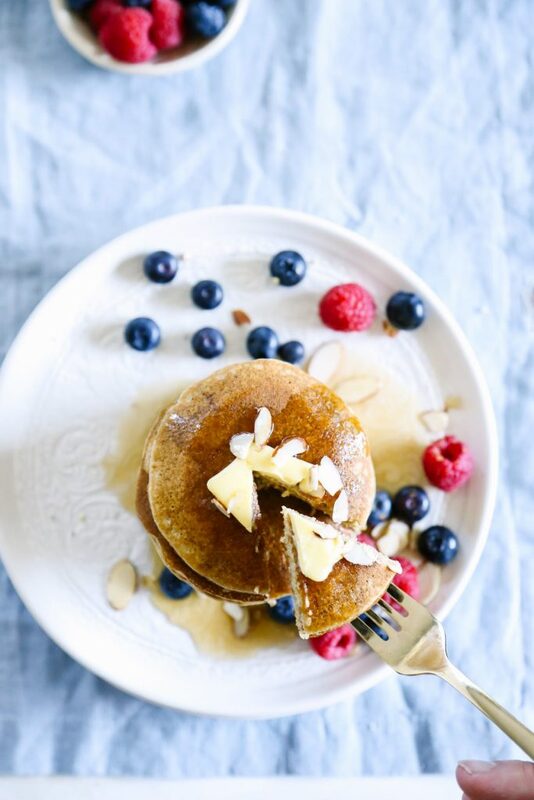 These pancakes (let’s switch over to plural now) are made with simple ingredients that can regularly be found in my real food fridge or pantry: old-fashioned rolled oats (yep, the same ingredient used to make a bowl of oatmeal), almond flour, spice, milk, maple syrup, butter, and eggs. That’s it! The wholesome ingredients are all poured into the jar of a blender, and 60 seconds later…a pancake batter is ready for a hot griddle. 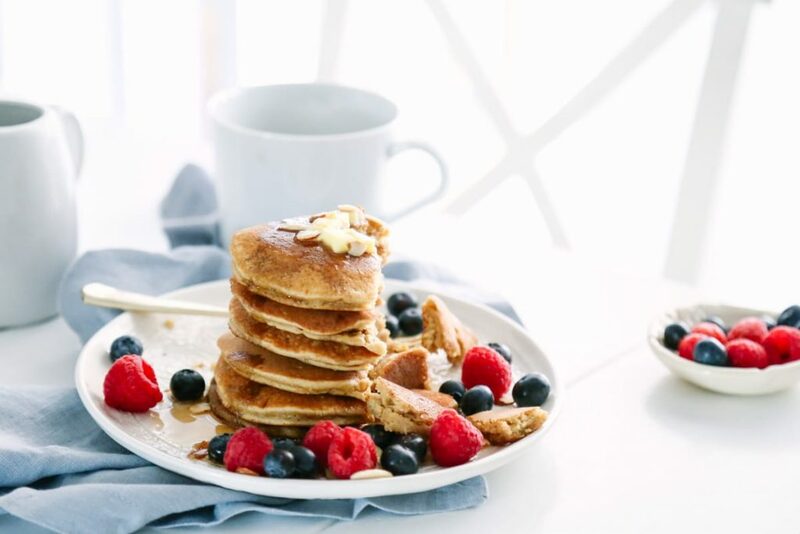 Yes, these pancakes are incredibly simple to make, which is kind of our jam around here (woah, someone had a bit too much coffee this morning…superhero pancakes and now jam? ), but that’s not the real reason these pancakes save so many of our too-busy-for-a-hot-breakfast mornings. These pancakes are an ideal meal to prep in advance. On the weekend, when pancakes are a necessity along with pastured bacon, I double the pancake recipe, let the extra pancakes cool, and then store them in the freezer for busy mornings. On that morning when I can barely pull myself away from the comfy sheets (we’ve all been there, right?! ), the kids need extra help finding shirts and socks, and I’m just not sure we’ll make it to school on time, these pancakes guarantee that everyone gets a hot and wholesome breakfast. That definitely earns a superhero status in our home! 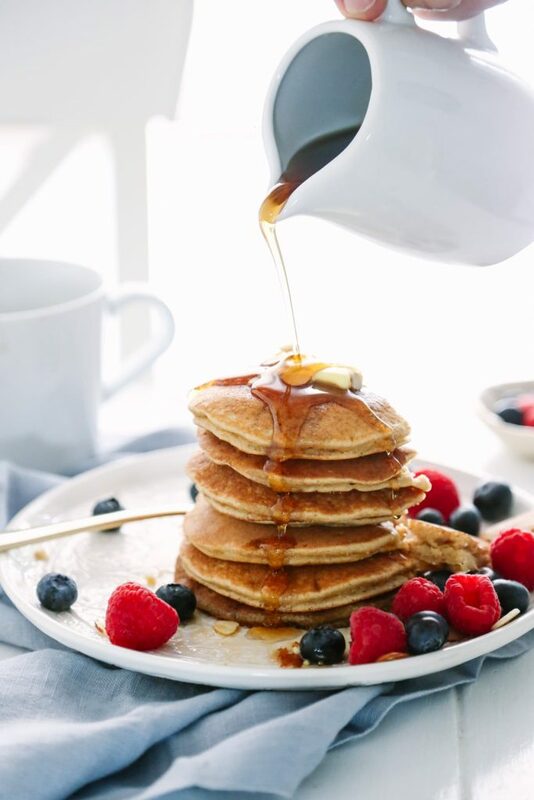 The beauty of pancakes is that nearly every pancake recipe out there, at least every pancake recipe on Live Simply, may be prepped ahead and stored in the freezer for busy mornings. 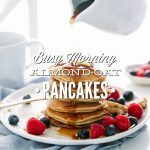 So add this pancake recipe to your weekend pancake rotation, and help it help you save your busy mornings! 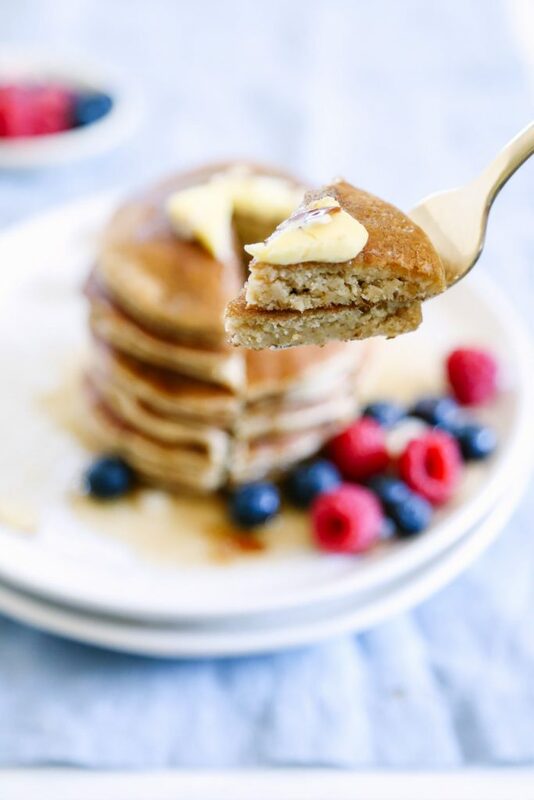 These pancakes are made with simple ingredients that can regularly be found in my real food fridge or pantry: old-fashioned rolled oats, almond flour, spice, milk, maple syrup, butter, and eggs. That’s it! The wholesome ingredients are all poured into the jar of a blender, and 60 seconds later…a pancake batter is ready for a hot griddle. Add the old-fashioned rolled oats to the jar of a blender. Blend the flour for 20-30 seconds, until it's ground into a flour-like consistency. 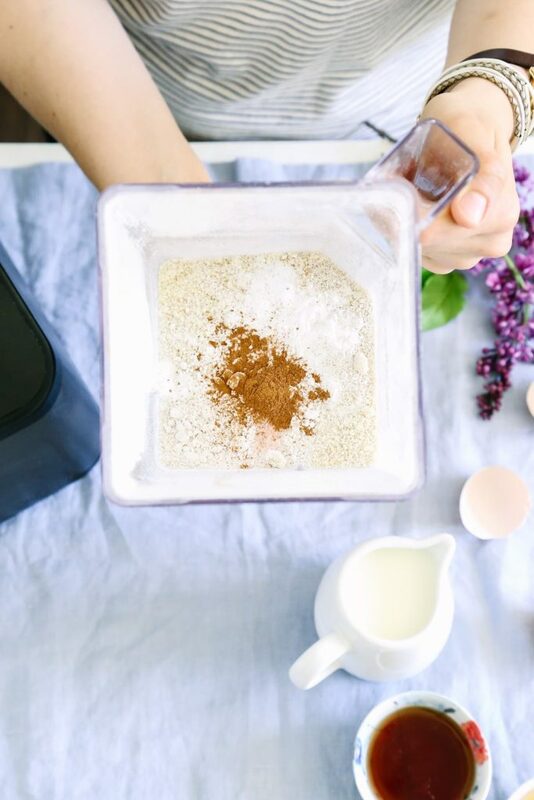 Add the remaining dry ingredients to the blender jar: almond flour, baking soda, baking powder, cinnamon, and salt. Then add the wet ingredients: milk, maple syrup, butter, eggs, and vanilla extract. Blend the ingredients for 20-30 seconds, until well combined. If you're using a high-speed blender you may only need to blend the ingredients for 10-15 seconds. I love the thick consistency of this batter. If you'd like thinner batter and pancakes, add 2 tablespoon-1/4 cup more milk to the batter. Heat a griddle or skillet. Grease the griddle or skillet with butter, ghee, or coconut oil. Pour the pancake batter on the griddle or skillet. Once the batter begins to bubble, flip the pancakes. Cook the pancakes for 2-3 minutes on each side, until cooked through. These pancakes are very light and moist thanks to the almond flour. Enjoy the hot pancakes and/or let the pancakes cool before placing them in a storage container or bag and freezing for later. To enjoy the freezer pancakes, simply reheat the pancakes in the toaster or the microwave for a few seconds. If you don’t have almond flour on hand, you can use 100% rolled oats in this recipe. I recommend following this blender recipe for the exact ratios (just skip the blueberries), since you’ll need to adjust the liquid and dry ingredient ratios. 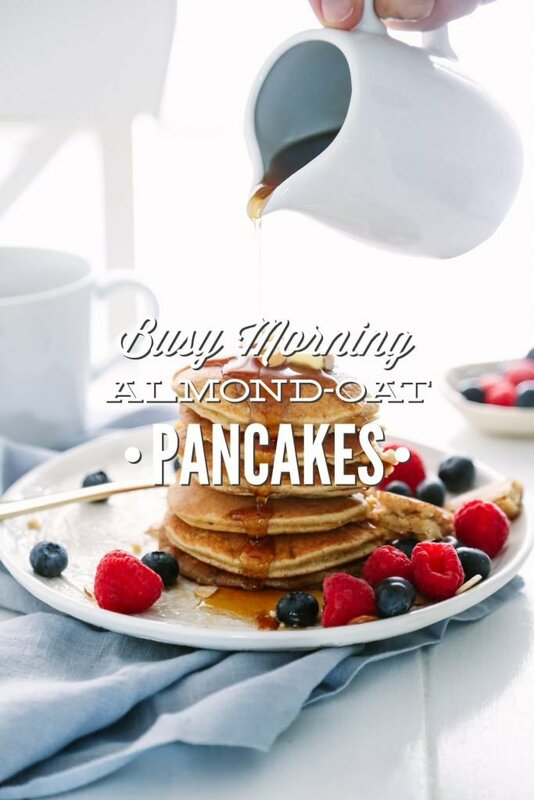 For dairy-free pancakes use almond, cashew, or (canned) coconut milk. Also, you can sub out the butter with melted ghee or coconut oil. I’ve used both salted and unsalted butter in this recipe. Use the frozen pancakes within 1-2 months for the best taste. I made these and they were delicious! I didn’t have almond flour, so I vitamixed up 177grams of almonds instead. Mine didn’t look quite as fluffy as your’s though… do you think my substitution was the culprit? It still tasted really good! Hey Morgan, That was a great substitution idea! Hmmm, I’m not sure if the almonds were the issue with the fluffiness…possibly. I’m glad they still tasted good! Yes, the batter thin or thick? I’ve found that thicker batter produces fluffier pancakes. I’m going to print this recipe for my kids to try! Doing the mixing in the blender would be a great way to simply the steps. Plus, easy to pour from the blender cup right onto the griddle. Awesome, Alissa! I hope they love the pancakes! Lol, I’m glad you enjoyed the cute distractions ????. Enjoy the pancakes! It turned out great! We will be making it. It was a dish the whole family loves. Wonderful, Sarah! So glad the whole family loved these pancakes! 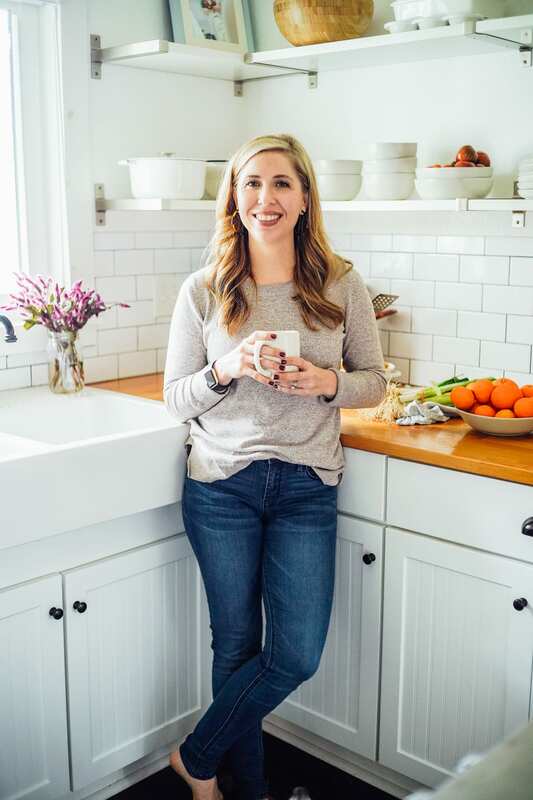 I am so glad that I opened your newsletter yesterday morning & saw this recipe. We had about an hour before my oldest son had to be at swim practice. I had everything on hand, but substituted coconut sugar because we were low on maple syrup. My 2 & 8-year-old almost ate all of them. I snuck a few out for my husband & I. Thanks, and great video. Your kids are adorable! That’s so great, Adria! I’m so glad your family enjoyed the pancakes!! I’m looking forward to trying these for my one-year old’s breakfast or lunch. Have you ever tried adding any greens like steamed spinach to the blender to sneak in some veggies into the meal? Hey Marta, What a great idea!! I bet you could definitely add some steamed spinach to the blender. I’m not sure how much…maybe a 1/2 cup to start? I wanted to make these this morning and just realized I am out of butter, can I sub coconut oil? Hey Heather, I apologize for my delayed response…I’ve been away from my computer all day. Yes, coconut oil will work! That’s OK, I already decided I am going to make them for dinner instead. Thanks! Great idea, Heather! One quick note, you may want to reduce the coconut oil to 2 TB, just to see how oily the batter gets. Hey Lisa, I’m so glad you enjoyed them! Adding spinach is a fantastic idea!! Hey Tammy, I don’t think the spelt flour will sub 1:1 with the almond flour. 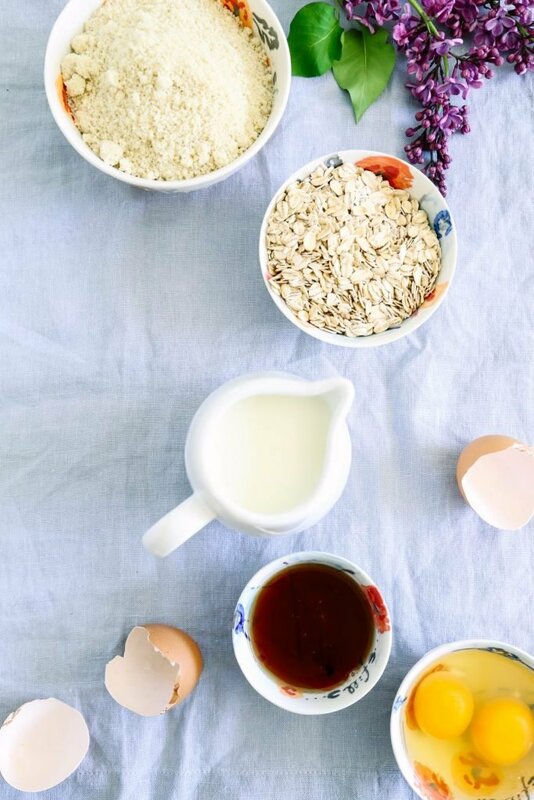 You could increase the oats, like this recipe: https://livesimply.me/2015/02/24/blueberry-surprise-oatmeal-pancakes-gluten-free/. I’m currently working on a pancake recipe for the fall with spelt flour :)! I have almond pulp that I saved from making almond milk. I dehydrated them. Can I blend that in my vitamin into a powder and use that? Or, should I play it safe and by it? Hey Donna, For this recipe, I believe the dehydrated pulp will work well! Let me know how it goes. Would using skim milk still work, or is the whole milk pretty essential? Hey Noel, Skim may be used in this recipe and pretty much any recipe on my site :). These were SO GOOD! And even better the next day, my little ones and I couldn’t stop snacking on them! Love that they are perfectly sweet on their own without maple syrup! Hey Monica, I’m so glad your little ones are enjoying the pancakes! Yay! I agree, they are so sweet on their own. I love to use the pancakes to make nut butter sandwiches because they’re just so good without any extra sweetener. The only pancakes I ever make now! So delicious! Thank you, Julie! I’m so glad you’re enjoying them! A winning recipe! I love the idea of making them into a nut butter sandwich. Delicious! Yay, Bonnie! I’m so glad you’re loving the pancakes. I make these all the time and keep a batch in the freezer always. They warm up nice in the regular toaster and the kiddos love these with honey for breakfast before school. Easy to make and easy clean up! Thank you! my kids love these, and so do i because they are healthy and i have no guilt feeding these to them. These are also perfect for my 10 month old who is just starting to eat food! Yay, Leslie! That’s so great to hear! These are the absolute best pancakes! They are so good! I use coconut milk and cook them in a bit of coconut oil spray. I save my grassfed butter for topping them ;). Halving the recipe fits perfectly in a Nutribullet. I would love to figure out how to use this recipe to make waffles. I tried it just as it is and I ended up with a huge mess :(. These are amazing! Made 2 batches tonight for morning breakfast. One just like recipe and one with spinach to make them green! Wonderfully light and tasty. Whole family loved it! 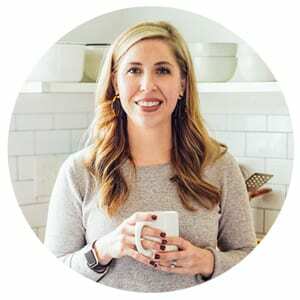 Hi Kristin, I make these pancakes all the time. They are absolutely delicious. I make them even though they never come out fluffy like yours. I thought I would try getting new baking powder and they STILL come out thin. Any ideas on how I can try to fix this? I am following your recipe exactly and although it was a long time ago, I’m pretty sure the first time I ever made them they were fluffy. Thanks in advance for your response. Hey Candace, I’m so glad you all love them! Are you using the grams measurement? That may help. If I wish to cut down on sugar and use less maple syrup, will adding more milk work? Thanks! Hey Jane, Yes, that’s what I would do. My son is allergic to eggs. Can you recommend a substitute? Hey Sylvia, Maybe a flax or chia seed “egg.” I’m not sure if that will work, but it’s the best possible solution I can think of. My daughter just made these to bring in for her nutrition class. They are excellent! Hers came out quite thin. Do you think she mismeasured or do you have a suggestion to thicken them? I love the idea to load the blender the night before too. Thanks! Hey Pamela, I’m so glad you all are enjoying them. Did she use the gram amounts? If not, there’s a good probability the volume measurement was off a bit–it’s easy to do. You can add more flour if this happens again to thicken the batter. Yum! I just made these for breakfast and the whole family loved them! I’m so thankful I found this blog. I’ve been slowly trying out all the recipes on here and I have yet to be disappointed. You’ve made the transition to eating clean food so much more realistic! Keep up the good work!! Yay, Karli! I’m so happy to hear that. Thank you for sharing. Very smart on the measuring. Hello! Can you please provide the serving size? I see calorie info but no yield. Thanks! what container do you use to store them them in the freezer? Hey Maggie, I use a Gallon-size ziplock bag.